Scatter River Old Growth Provincial Park contains a diversity of landscapes from high upland plateau and muskeg to the rapids of the Grand Canyon and river bottom old growth spruce forests. The park is home to moose, grizzly bear, Rocky Mountain elk, furbearers, northern long-eared bats, and ecosystems associated with succession from the series of large forest fires that have swept through the Liard River valley. The area in general offers fishing, hiking, camping, horseback riding, canoeing, river boating, wildlife viewing, hunting, ATV use, and photography. The Grand Canyon of the Liard, a 30 km stretch of river with dangerous rapids, is an area of tremendous visual quality. Access to the park is by the old road to Nordquist Lake and Elk Mountain. River access is via the Fort Nelson River off of the 77 Road or Sulpher Creek; some boaters travel the Toad River to reach the park. The Scatter River Old Growth Provincial Park is located along the most northerly progression of the Liard River Corridor in northeastern British Columbia. It is adjacent to one of the most significant hotsprings in Canada, the 1082 hectare Liard River Hotsprings Provincial Park, located on the Alaska Highway, 317 km northwest of Fort Nelson. Access to the park is by ATV, foot, horse or boat. One motorized route provides access to the north side of the Liard River Corridor Park. 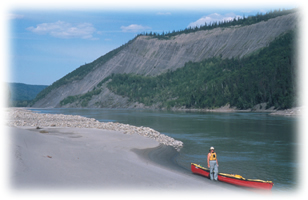 River boat access is via the Liard River. Approved Purpose Statement and Zoning Plan [PDF 2.54MB] for Scatter River Old Growth Provincial Park is available online in pdf format. Scatter River Old Growth Provincial Park offers opportunities for backcountry horseback riding. Riders should be experienced and prepared for wilderness travel, as there are no designated trails. Pets/domestic animals must be on a leash at all times and are not allowed in beach areas or park buildings. You are responsible for their behaviour and must dispose of their excrement. Dogs should be under control to avoid any potential problems with wildlife. Winter Recreational opportunities are available.